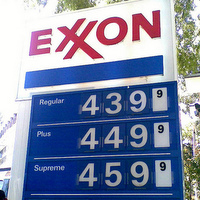 As the 2012 elections draw closer, the numbers at the pump could directly effect the ones at the polls. President Obama has had to quash criticisms that the climbing gas prices were owed to stalled domestic oil production. Rather, the spike is owed to the Middle East instability and most noticeably the unrest in Libya. Regardless of the origin of higher gas prices, they point once again to the importance of new, clean, and renewable sources of energy with prices that don't rise and fall with the political tides. Wind and solar power generated here at home won't be derailed by oil spills, cut short by political unrest, or subject to shutdown amidst public health concern. Such reasonable analysis, however, seems beyond the current Congress. House Speaker John Boehner, is working hard to connect high gas prices to EPA rules in an attempt to further support for revoking the EPA's authority over greenhouse gasses. Meanwhile, Representatives Fred Upton (R-MI) and Ed Whitfield (R-KY), of Dirty Air Bill fame, have been touting the proposed measure as the cure-all for the rising gas prices. In a joint letter by Upton and Whitfield titled "Concerned About High Gas Prices? Cosponsor H.R. 910 and Make a Difference Today!" they argue that derailing the Clean Air Act and the EPA is our only chance at salvation. When weak connections are made between the EPA's regulatory measures and the sticker price on gasoline or leaving Americans without a livelihood, we tread on dangerous territory that leaves us misinformed or uninformed about much higher costs. Representatives Upton and Whitfield aren't presenting a solution to pump prices. They're not offering alternatives or innovation -- they are reinforcing dependencies on old habits that stunt our investment in a clean, and reliable, energy future. High gas prices are hurting American families. So are the billions of dollars spent in medical bills and hospitalizations caused by toxic pollutants expelled from coal-fired power plants, and so is the remaining oil in the gulf of Mexico. As Naomi Klein put it recently on Democracy Now! ... We are now in the era of extreme energy. The easy-to-get fossil fuels have pretty much been gotten, and now it’s the harder-to-get stuff, the more-expensive-to-get stuff and the riskier stuff... I think we need to get away from this idea that we’re just going on as we’ve always gone on. No, we aren’t. If we don’t get off fossil fuels, we are accepting a much, much higher-risk energy trajectory. Volatile prices, risky energy solutions. There is a way out. We can tackle the climate crisis, we can pursue a clean energy future, but first we need you. We need to come together and demand it. We have to stand up and be counted as advocates for a clean American energy future. In the next few weeks, as we join 350's "The U.S. Chamber Doesn't Speak for Me" campaign, we will be asking business owners to stand up and be clear that when the US Chamber advocates against the Clean Air Act, against climate science, for continued fossil fuel subsidies, that they are not representing Main Street. They are representing the profits of the elite few corporate polluters who have no shame in making us pay for their mess. So don't be trapped into complaining about Rep. Upton's irrational war on science, don't sit around and talk about how corporations are corrupting our democracy, stand up and be counted. Do something.